Continental and local declines in many bird populations have led to concern for the future of migratory and resident birds. The reasons for declines are complex. Habitat loss, modification and fragmentation, loss of wintering and migratory habitat, and brood parasitism have been implicated. In 1990, the National Fish and Wildlife Foundation brought together federal, state, and local government agencies, foundations, conservation groups, industry and the academic community to form a program to address the problem. 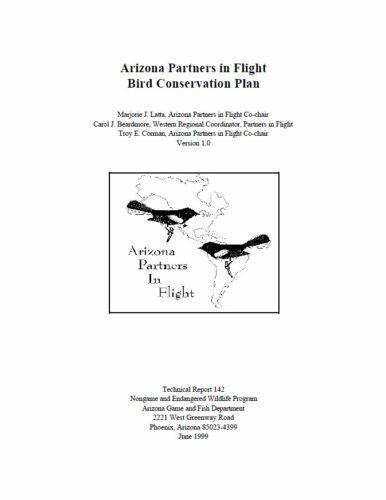 Thus, Partners in Flight was conceived as a voluntary, international coalition dedicated to “keeping common birds common” and “reversing the downward trends of declining species.” These plans were developed as part of the national Partners in Flight effort. Effective and efficient ecological management involves determining which species and habitats are most in need of conservation. This plans identifies priority species and habitats, and establishes objectives for bird populations and habitats. The plan focuses on microhabitat requirements of priority species, but also identifies landscape scale requirements. Conservation actions are recommended and partnerships are identified to accomplish the objectives.